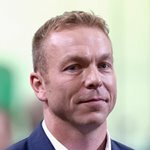 Chris Hoy is a Scottish track cyclist representing Great Britain at the Olympics and World Championships and Scotland at the Commonwealth Games. Hoy is an eleven-time world champion, six-time Olympic champion and a winner of a total of seven Olympic Games medals, six gold and one silver. 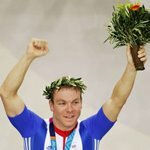 Hoy is the most successful Olympic cyclist of all time. 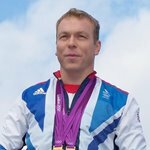 With his three gold medals in 2008 Summer Olympics, Hoy became Scotland's most successful Olympian, the first Briton to win three gold medals in a single Olympic Games since Henry Taylor in 1908, and the most successful Olympic cyclist. 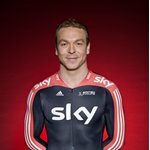 He won a further two gold medals (in the keirin and team sprint) at the 2012 Summer Olympics, making him the most successful British Olympian of all time in terms of gold medals, and the joint most decorated athlete with fellow cyclist Bradley Wiggins with seven medals in total. 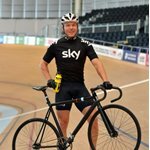 Hoy joined his first cycling club, Dunedin C.C., in 1992, and began concentrating on track cycling in 1994, when he joined the City of Edinburgh Racing Club. Hoy won silver at the 1999 UCI Track Cycling World Championships in the team sprint, riding as the third man. 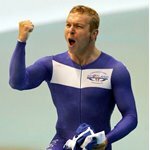 Regular team mates in the team sprint over the years have included Craig Maclean, Ross Edgar, Jamie Staff, Jason Queally, Matthew Crampton and Jason Kenny. The team's first World Title came in 2002, in the Ballerup Velodrome, Copenhagen. Hoy also won the Kilo (1 km track time trial) title the same year beating Arnaud Tournant by 1/1000 of a second. Hoy was an ambassador for the 2012 Summer Olympics in London. Hoy led Team GB out as the team's flag carrier at the opening ceremony at the London 2012 Olympic Games. 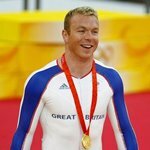 He then went on to win gold in the team sprint with Jason Kenny and Philip Hindes, setting a new world record in the velodrome and becoming Team GB's joint gold record holder with Sir Steve Redgrave's tally of five gold medals with a total of six medals (5 gold, 1 silver). 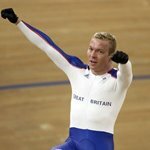 On 7 August 2012 Hoy won gold in the Keirin to overtake Sir Steve Redgrave and become the most successful British olympian ever, winning a total of 6 gold medals, This also made him the joint holder of most medals won by any British athlete in the Olympic Games with fellow cyclist Bradley Wiggins.